The Frist Center for the Visual Arts boasts a new exhibit called Mexico and Modern Printmaking: A Revolution in the Graphic Arts, 1920-1950. The exhibit will run from February 2 through April 15, 2007. A short synopsis is below, and a full schedule of events related to the exhibit are here. Events on the immediate horizon include a free presentation by the curator on Friday, February 2 at 6:30pm and portrait-making sessions for children 5-10, starting Saturday, February 3 (more information on the exhibit events page here). The exhibit has been covered in the Scene and on WPLN (web / audio / transcript). Update 2/9/07: the Nashville City Paper has reviewed the exhibit here. An accompanying exhibit at the Frist features the artwork of Antioch High School students and is called "Contemporary Cultures." 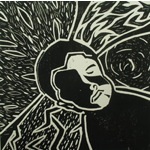 Included are prints created by students who participated in an after-school printmaking program organized by the Frist Center and held in fall 2006. Led by two local printmakers, the Frist Center program offered lessons in printmaking techniques and addressed concepts presented in the exhibition Mexico and Modern Printmaking: A Revolution in the Graphic Arts, 1920–1950 (on view at the Frist Center from February 2-April 15, 2007). After creating a series of prints that reflect their ideas about contemporary culture and society, the participants selected their best works for this exhibition. Student artists included Aubrey Cox, Nidia Gonzales, Kathryn Herbert, Ronald Hereford, Manychanh Kittirath, Bethany Lawson, Alex Mitchell, Reginald Myriek, Rosalba Ortiz, Magen Parmer, Claudia Perez, Elisabeth Rodriguez, Crystal Soverall, Brooke Stigerwaldt, and Denae Woodward. Teaching artists were Martin Cadieux and Julie Sola. Also in conjunction with the main exhibit, the Thompson Lane Public Library is sponsoring free art classes for children 10 and up. Classes will be in Spanish on Thursdays in February from 4-5:30pm. Call Martin Cadieux at 615-744-4911. Reservations required by February 7. Mexico and Modern Printmaking: A Revolution in the Graphic Arts, 1920-1950 examines the vital contributions made by Mexican and foreign-born printmakers working in Mexico. 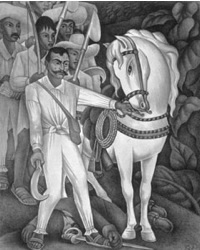 The exhibition features 125 prints and posters by 50 artists, including Diego Rivera, José Clemente Orozco, and David Alfaro Siqueiros, who, while best known for their revolutionary murals and paintings, made extraordinary contributions to the field of printmaking, which they embraced because it could reach a wide audience with their political message. In addition to important prints by well-known Mexican artists, the exhibition will also feature works by such foreign artists as Americans Charles White and Elizabeth Catlett, who were affiliated with the Taller de Gráfica Popular, a celebrated cooperative print workshop founded in Mexico City in 1937. Playing a crucial role in sustaining the ideals of the Mexican Revolution, the workshop printed limited-edition works to capture the attention of international collectors, as well as mass-produced posters and leaflets intended for widespread distribution to the native populace.